Passed away 04.04.2019. Much loved mother of Karen and Don Sloper and Jan and Phil Dook. Special grandmother and great grandmother to Kara, Jay, Catherine, Alex, Harley, Stella, Millie and Saoirse. Love to you Mum. Now resting peacefully. 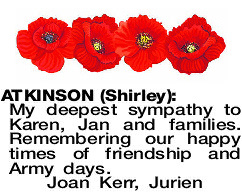 The Funeral Service to celebrate the life of Shirley Atkinson (nee Cluning) will be held in the Mareena Purslowe Reflections Chapel, 31-33 Townshend Road, Subiaco, on FRIDAY (12.04.19), commencing at 1.00pm. My deepest sympathy to Karen, Jan and families. Remembering our happy times of friendship and Army days. ATKINSON SHIRLEY Fond memories of our childhood holidays at Meelup. Our thoughts are with you Karen, Jan and families. May memories help. Kim Chris Jan John.